DALLAS—Dallas and surrounding areas have been a hotbed of protests demanding murder charges be filed against a White Dallas police officer, Amber Guyger, for the fatal shooting of Botham Shem Jean, a young, Black man who was well-loved, admired and respected. A major protest occurred in nearby Arlington, Texas, at AT&T Stadium where the Dallas Cowboy’s home season opener was underway. Protesters displayed two caskets, one representing Botham Shem Jean and one for O’shea Terry, an unarmed Black man shot and killed by Arlington Police in early September as he attempted to flee a traffic stop. Nine protesters were jailed and at Final Call presstime, were still in custody. Protests have been a daily occurrence in the city. What happened between Botham and Off. Guyger that led to him being shot in the chest? The family does not know and the Dallas Police Dept., Texas Rangers, nor the district attorney’s office have provided answers. Many are still disturbed it took nearly three days for Off. Guyger to be charged, that the charge is manslaughter and not murder and that she is out on bail. Off. Guyger remains a paid member of the Dallas Police Dept. She is on departmental leave and free on bond. A grand jury will hear evidence in the case. Jean family attorneys have presented two witnesses to the district attorney. They say they heard Off. Guyger knock on Botham’s door, telling him to open up, and moments later a man’s voice, possibly asking “why?” after shots rang out. “When I first heard this case, before I was even hired, I thought that officer had to be really drunk getting off work to wander into the wrong apartment. All indications show that she was actually probably pretty sober,” said S. Lee Merritt, Jean family attorney. He questions the tale that a tired Off. Guyger wandered into the wrong apartment and a door that automatically closes was open. The door would not have swung open with her key and none of her story makes sense, the attorney added. It has been reported that Off. Guyger has moved from her apartment, which authorities apparently had not filed a warrant to search. However, police searched Botham’s dwelling on day one. A small amount of marijuana was reportedly found. “They asked for permission to find evidence of drug paraphernalia, that’s specifically what they asked for. So, this was the plan from the Dallas P.D. investigators from the beginning, to look for ways to incriminate the person they just killed,” charged Atty. Merritt. Harvey Levin, of TMZ fame, could not believe what he heard from Mr. Merritt in a televised interview. “You’re telling me that a guy that was in his own place, and somebody walks in and shoots him in his own place, that their go to is to see if the guy has drugs?” asked Mr. Levin. Atty. Merritt told Mr. Levin and TMZ viewers this is the normal playbook when an officer is accused of a crime. The victim is villainized, he said. Police officials said the search was standard for a crime scene. But why was the alleged discovery of marijuana leaked to mainstream media? 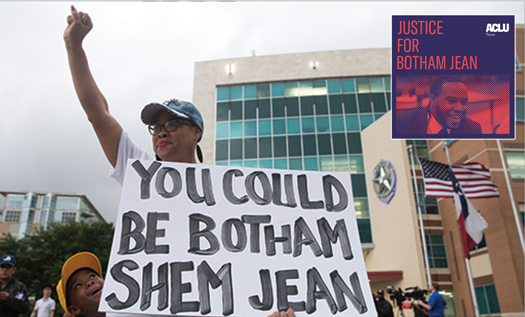 The same day the Jean family was laying Botham to rest, Fox 4 News in Dallas reported a black backpack with police equipment, paperwork, a bullet proof vest and marijuana were found in Botham’s apartment. Olinka Green, longtime freedom fighter and Dallas activist, said the drug discovery and media story are straight out of the “White Supremacy Handbook” to demonize Black people, especially anyone abused by the authorities. “White supremacy always has to demonize the Black man, as we saw with Mike Brown,” he said. The teen looked like a big Hulk, they don’t see us as human beings, said Mr. Green. Dr. Frances Cress Welsing, the late scholar and psychologist, said in order for Whites to kill Blacks, Blacks cannot be seen as human, Mr. Green continued. “This culture of White supremacy has to vilify to justify the killing of us. She said she walked into a dark apartment. What’s the first thing you do when you walk into a dark apartment? You turn on the lights. To me it’s ‘White panic’ that got her scared where she killed a Black man, then next there are lies to justify the killing,” argued Mr. Green. “Character assassination also usually occurs when it is too obvious that a conspiracy is happening to cover up the fact that a White police officer, yet again is this country, has unjustly pierced and killed a Black target with a bullet,” said Charlamagne Tha God on “The Breakfast Club,” a New York-based, nationally syndicated radio show. Charlamagne chose Fox 4 News in Dallas for his infamous “Donkey of the Day” award for coverage demonizing Botham. District Attorney Faith Johnson, who is Black and Republican, turned the case over to a grand jury. It could take months to decide if Off. Guyger will be indicted for manslaughter, face other charges, or not be indicted at all. Dallas police chief U. Renee Hall, who is a Black woman, handed the case over to the Texas Rangers for investigation. Her decision has intensified mistrust, anger and questions about police handling of the case. “From start to where we are now, none of the protocols have been applied and it’s extremely frustrating to citizens trying to understand what is happening, what is true, because so many details and questions have been left unanswered,” former Dallas police chief David Brown said in a statement to ABC News. “Turning the case over to the Texas Rangers is adding to the fuel of the bizarre shooting of Mr. Jean,” he said. Botham, or “Bo” as he is referred to by protesters, won’t be forgotten, they say. He had no criminal record, was on his way to success, and loved by everyone that met him, said activist Rakem Balogun.